I've posted a few pictures of our first Dalmatian, Dottie, but today we're celebrating Tigger's birthday. 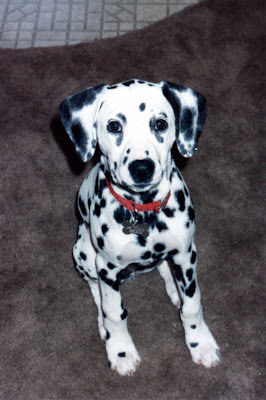 Tigger was our second Dalmatian. She joined our family in 1991 as a seven-week-old puppy. This is a photo of Tigger as a pup. She was a beauty! While Dottie was somewhat shy and timid, Tigger was as outgoing as they come. Some of that rubbed off on Dottie, and the two of them were great together and had many fun adventures. With a first place qualifying score of 95, Jazz earned her AKC Rally Novice (RN) title today at the South Hills Kennel Club trial in Waynesburg. She did a great job and finished her title in three successive qualifying runs. While we're not quite ready to move into Rally Advanced just yet, we look forward to some additional training and being in the Rally ring together again soon! Tess and Jim had an awesome first place qualifying run on a very tough course to earn their AKC Excellent Jumpers with Weaves (AXJ) title today. Tess was the only 24" Excellent A dog who qualified. Now it's on to Excellent B JWW, where we'll need 10 qualifying runs to title. Wow! Tess also had a beautiful Excellent A Standard run with another first place qualifying score. This was her first leg towards her Agility Excellent (AX) title. Tess and Jim have been running great together. Perhaps Tess senses the upcoming competition from little sister Jazz!! Here are the two videos from Jazz's runs at the NADAC trial yesterday. She ended up with four clean runs, although all were just over time. In any other venue, these would have been qualifying runs. I knew when we entered NADAC that we weren't likely to make course time, but this was a good location for Jazz's first trial, and NADAC has fun games like Touch 'n Go and Tunnelers for Jazz to play. First up was the Touch 'n Go run. We did very well, with the exception of some confusion on the A-frame. She was interested in that the day before, too. The contact obstacles at this trial had new rubber contacts, and Jazz has never been on a surface like that before. As you can see, the farther into our run we got, the more confident Jazz became and the faster she ran. She didn't appear to be too stressed and she ran happy, which was the goal for the weekend. Jazz's last run of the weekend was Tunnelers. Again, she ran clean and was just two seconds over time. Consistent with her other runs, she ran faster as we got farther into the course. I think we're very close to putting it all together and running really nicely together! We'll try a few more runs at the CPE trial in the end of June. I don't want to push Jazz too far too fast, but I think she enjoyed her opportunity to get out and run agility like her big sister Tess! Here's the video from Jazz's very first official agility run at the NADAC trial in Zanesville, OH, this afternoon. I am soooo proud of my baby girl! She ran beautifully for me, and although she didn't qualify, she did have a clean run and earned first place. Those of you familiar with NADAC agility know that they have probably the tightest course times of any venue. Jazz was just two seconds over time (although she beat Tess' course time on her Touch 'N Go run!) This was the very first time that Jazz has run an agility course outside of our training club, so our goal for the weekend was just to have fun runs as stress-free as possible. As you can see from the video, the more we ran, the more confident and happy Jazz became. It was a lot of fun to finally run Jazz in competition. We also had a Tunnelers run today, but the trial ran late this evening and we have an early morning tomorrow, so I don't have time to upload the video from that run. Jazz also ran clean, but her silly handler did a rear cross where a front cross would have been a better choice for the dog, so we ate up some time fixing that. Otherwise, it was another great run. Even after my rear cross bobble, Jazz continued to run happy and had a strong, fast finish to the course. I'm looking forward to running Jazz again tomorrow and we'll probably enter a couple classes in the CPE trial later in June, given the fact that Jazz seemed so comfortable at this trial. 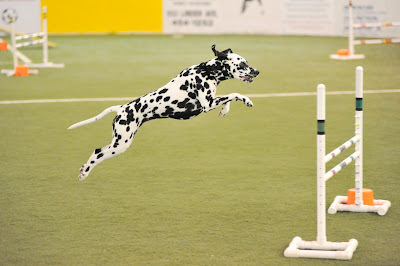 Jazz returned from her Touch 'N Go run to the applause and cheers of our agility friends at the trial. Thanks to everyone for their emails, phone calls, and just plain good mojo! It meant a lot that we had so many friends thinking of us on Jazz's first run today. I hope this is the beginning of a wonderful team relationship for me and Jazz in agility. She's an awesome girl!! Tess also had a great day, earning her Open Jumpers and Novice Tunnelers titles. Look out, Tess...you'll soon be sharing the limelight with your little sister Jazz!! I've been tagged by Jenn to describe how Tess and Jazz came to be our Dals. I'll start with Tess first, since she's the oldest. It was 2005, and we had just lost our second Dal that February. 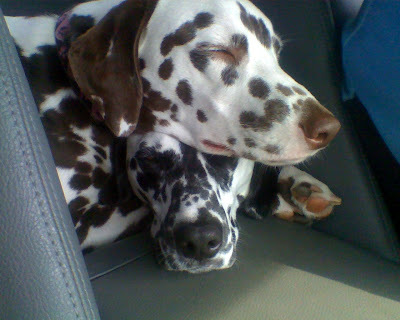 By June, our hearts were aching for another Dalmatian, but no one we knew was breeding. I finally got in touch with some old friends from the Greater Pittsburgh Dalmatian Club, and they suggested LaDonna King at Kingdom Dalmatians. LaDonna didn't currently have a litter, but she had plans to breed her Gia. 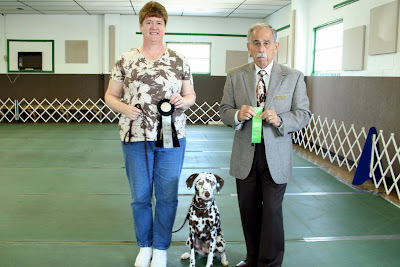 In late June, we attended the Greater Pittsburgh Dalmatian Club's specialty show to meet LaDonna and Gia. We instantly loved them both and decided to wait for a puppy from Gia's upcoming litter. In the meantime, LaDonna was talking with another Dal breeder and found out that that breeder had two female black and white Dal puppies with her, which is exactly what we were hoping for. Sensing how badly we missed a Dal in our life, LaDonna suggested that we look at these two puppies, as they came from a good breeder. I fell in love with Tess the instant I saw her. She had the mostly black ears that my beloved Dottie had and was a happy, spunky puppy. Tess' breeder had preliminarily named her Starwood's Touched by an Angel, and we liked the name and thought it was appropriate. Ever since Tess came into our life, we truly have been "Touched by an Angel." Fast forward to 2007. We had remained friends with LaDonna King and still admired Gia. When LaDonna announced that she was going to breed Gia again, we were one of the first ones on the list to get a puppy. An extra bonus is that the sire of the litter was a sweet, handsome boy named Tolliver, co-owned by two of our Dal Club friends, Nanci Good and Barb Allison. We had told LaDonna that we'd love to have a liver-spotted female, but she wasn't sure that Gia would have liver puppies, as she had 12 black and white pups in her first litter. Well, on November 30, Gia had ten beautiful puppies, including a liver and white girl!! LaDonna cautioned us that that particular puppy may not be appropriate for our household and we'd have to see how her personality developed. As it turns out, that little liver female, then known as Savannah, was determined by LaDonna to be the best fit for our family, and she came home with us and became known as Kingdom's All That Jazz. As you can see by all the photos on the blog, Tess and Jazz are best buddies. They are a wonderful pair, and we're thrilled to include a Kingdom Dal in our family. Thanks, Jenn, for giving us the opportunity to share how Tess and Jazz came into the Bauer household! I'd like to tag LaDonna to tell us how Gia, Steeler and Jazz's mom, came to Kingdom Dalmatians. Hard to believe that it's been 21 years since Dottie was born, the dog who, in 1988, became our first Dal and started us on this spotted adventure! 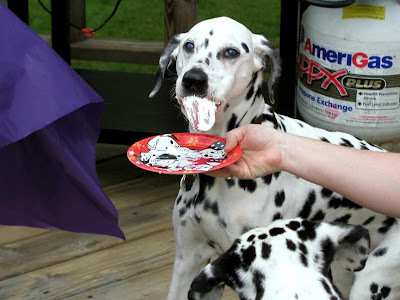 Here's a picture of Dottie with a tongue full of icing from her birthday cake. This photo was taken in 2002, when our precious Dottie would have been 14 years old. 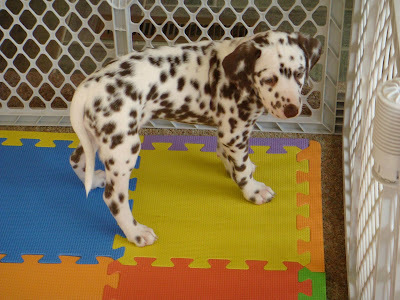 All these years later, we continue the tradition of spoiling our spotted babies...and receive so much in return! I've been away at a conference, but I wanted to post this picture that was taken with my cell phone on the way home from an agility trial on Memorial Day weekend. This is Jazz sleeping on Tess's head on the center console of Jim's truck! The girls don't normally sleep this way, but neither one of them wanted to give up their prime spot on that console. It's a rare treat for them to ride in the truck, rather than in the back of my Pacifica, so they both try to sit in the middle where they can see out the windshield. Unfortunately, Tess and Jazz didn't stay awake long enough to enjoy the view!